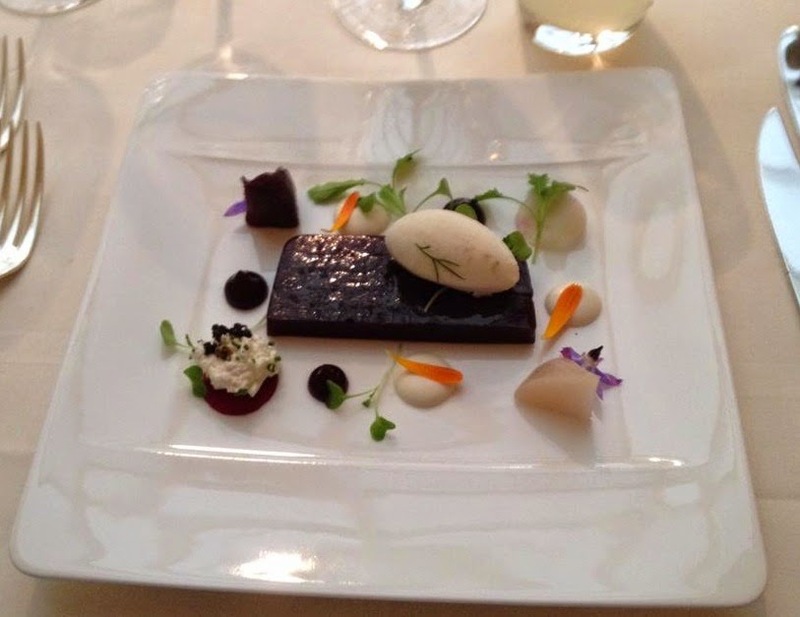 I recently had the pleasure of dining at Le Manoir aux quat’saisons in Oxfordshire. 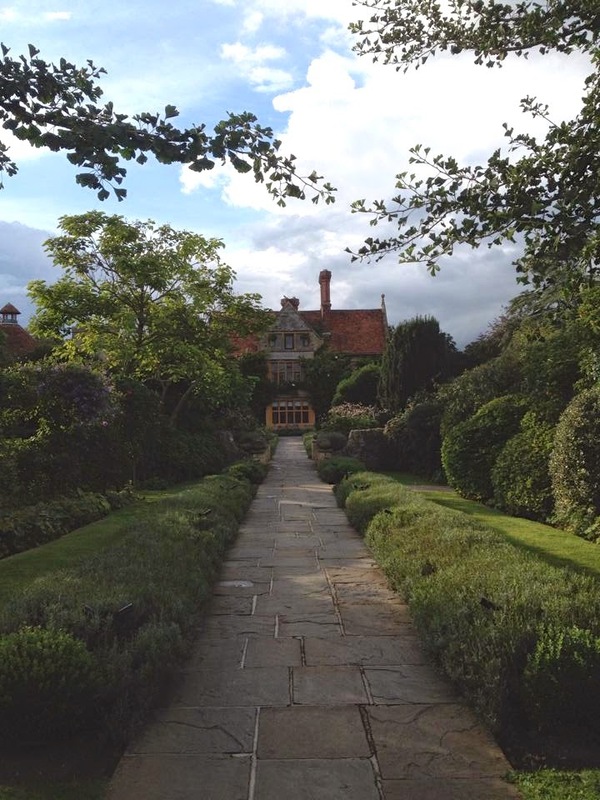 It is located in a beautiful village called Great Milton (where the properties have high price tags) and is owned by the delectable Raymond Blanc. 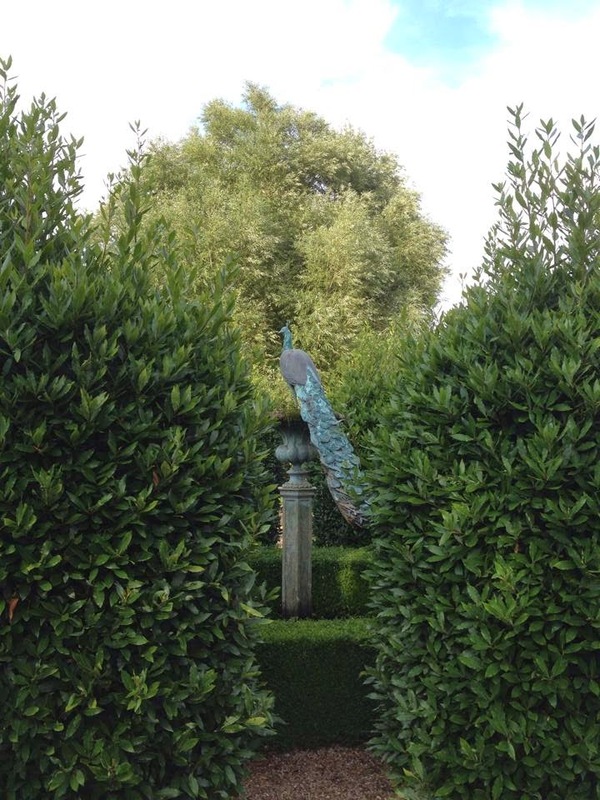 The country house setting is idyllic and the grounds feature a croquet lawn, orchards and a well stocked kitchen garden with beautiful rows of herbs, fruit and veg, perfect for picking and using in the restaurant. 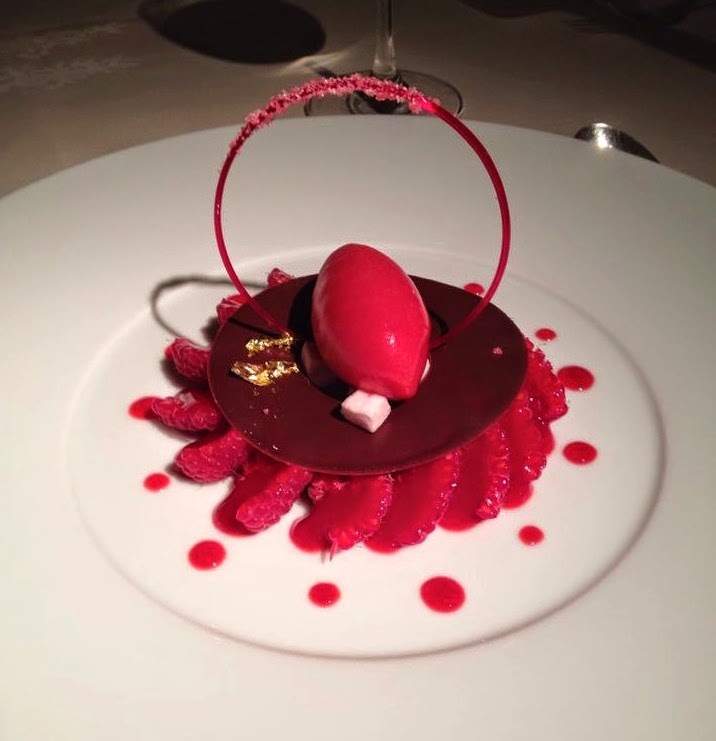 The restaurant has held two Michelin stars for the last 29 years, an accolade that they clearly know all about how to retain. 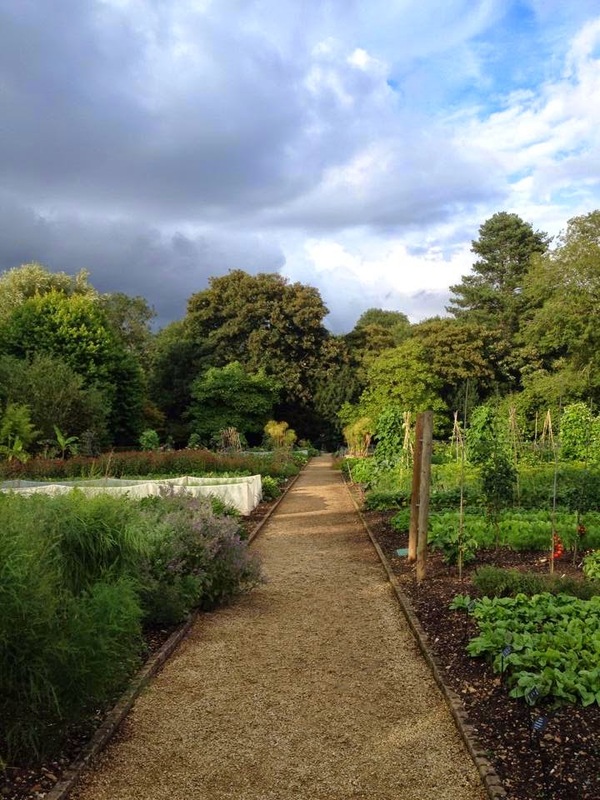 Rows and rows of gorgeous fruit, veg and herbs ripe for the picking. Puts my allotment offerings to shame. We were all warmly welcomed to the venue, and sat in a beautiful lounge with our menus to peruse, and an epitome of a wine list promptly appeared. I avoided looking too closely at the wine list as I had elected to drive; it’s probably just as well as I might have then been tempted, although the prices were appropriately high. I did succumb to a cheeky wee gin and tonic as I figured I was going to be there for quite some time. Another guest couldn’t resist ordering a glass of a wonderful Australian red wine called Ten minutes by Tractor which I did have a sneaky sip of, and it was amazingly good. The Sommelier informed us that the wine takes its name from all of the vineyards being no more than ‘ten minutes by tractor’ from the winery where they are produced. We all opted to go for the ‘Dining experience’ menu (don’t look mum… £154/head), described as ‘Seven exciting courses, with unexpected flavour combinations which make this menu a real culinary adventure’. I did have a look down the list of courses within this and was marginally dismayed by the desert which was offered ‘Textures de noix de coco et grand cru de chocolat du Ghana’ or Textures of coconut and Ghana chocolate Grand Cru’. 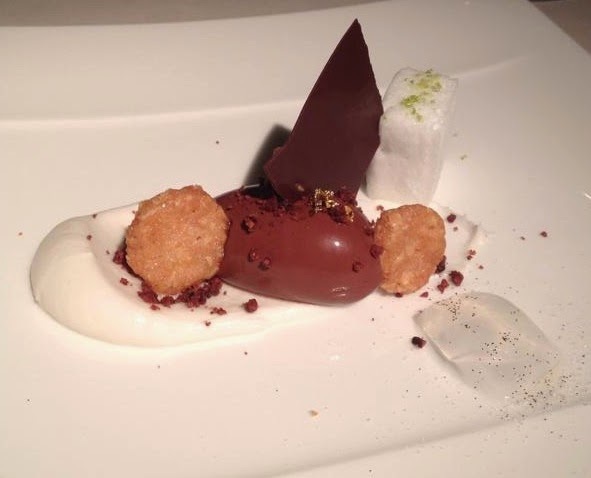 I am not a coconut fan, and neither do I value chocolate particularly, so I opted to ‘upgrade’ (+ £15) my desert for one from the a la carte menu which was entitled ‘cassoulet d’abricot’. Well if I’m already spending so much money, I might as well add more to get something I’d like n’est pas? 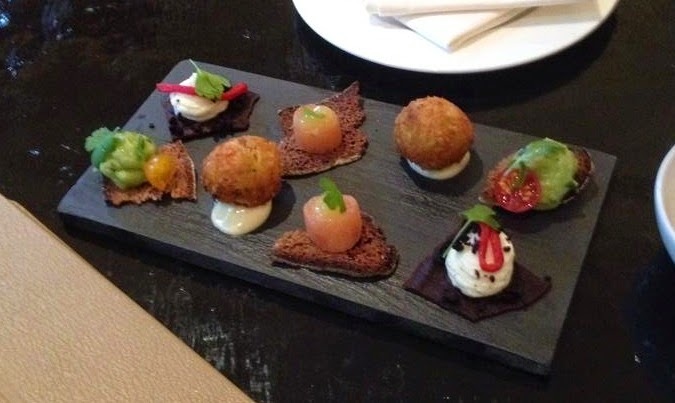 Our foodie delights started with our amuse bouche. Tastefully served on dark grey slate and consisted of something like the following (but with posher names) a bit of guacamole on something crispy, a tasty ball of either saffron or turmeric stuff, a smoked salmon bite and a goats cheese ball with black olive. One guest was given an alternative board as he’s allergic to chili and the restaurant were very obliging at providing an alternative for him. We were then moved in to the dining room, a rather informal setting with glass windows looking out on to the lawns and gardens. The dining room was very unstuffy, but perfectly comfortable (which also pretty much sums up the waiters and all staff for the evening, attentive but not in your face). I was delighted to not be offered a ‘table stool’ for my handbag when I placed it by my chair (seriously has anyone ever thought in a posh restaurant ‘I don’t want to put my bag down on the floor in here’!?). 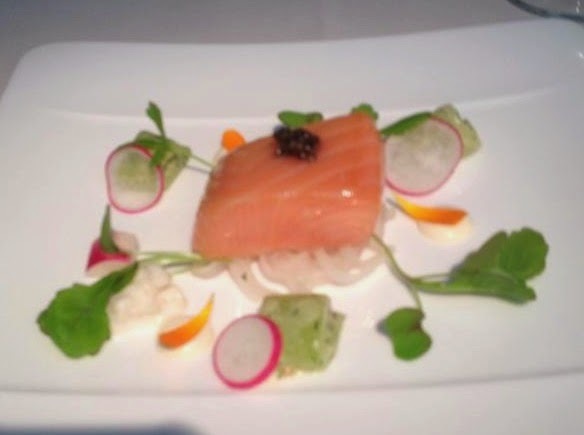 We then moved on to the Mi-cuit de saumon, raifort, concombre (Warm confit of oak smoked salmon, horseradish, cucumber) that was served on shredded mouli, the cucumber was lightly pickled with dill and the salmon was beautifully melty in the mouth. 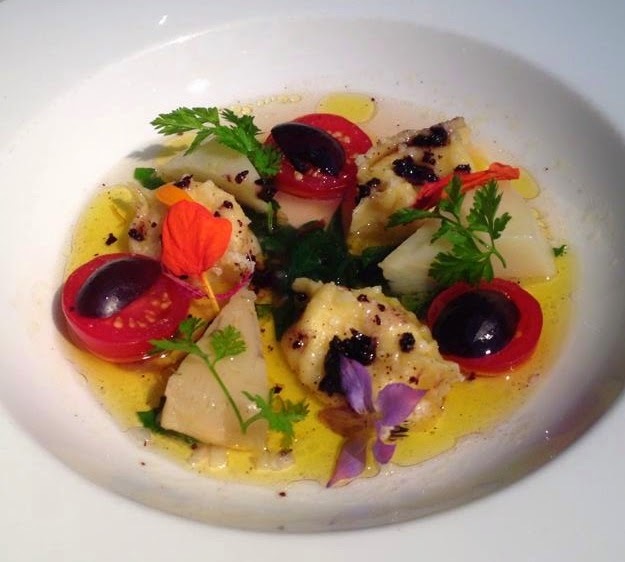 Our next offering was ‘Agnolotti de fromage de chevre, miel, artichauts, olives (Agnolotti of goat’s cheese, honey, artichokes and olives). Oh my! This was amazing, so delicate but super tasty, the agnolotti (something akin to a small ravioli) were deliciously packed with goats cheese and crumbled dried olives gave a wonderful unexpected crunch to the dish. Just as we were thinking our ‘main’ must be next, we were treated to ‘Crabe, fleur de courgette du jardin, puree de crabe’ (Devonshire crab, garden courgette flower, crab puree). 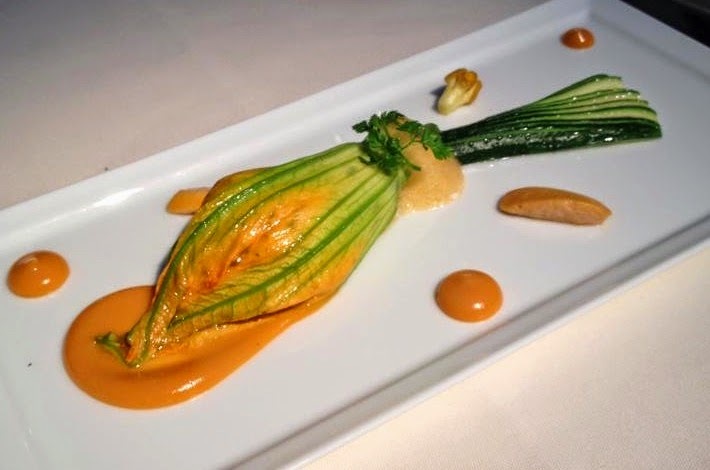 This was very delicate, arranged on the plate to resemble a fish and the courgette flower was stuffed with much deliciousness in the shape of a light crab mousse. And it was here! 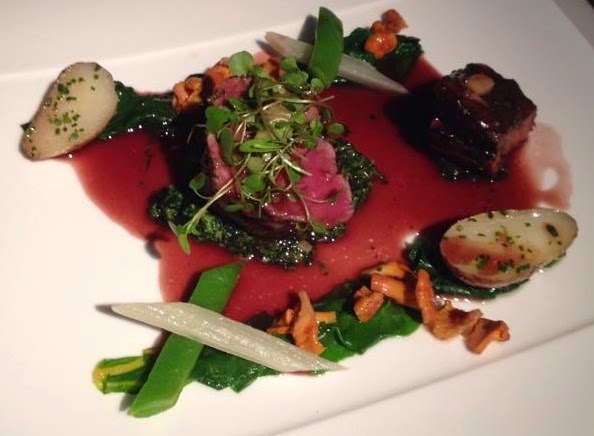 Finally the main, ‘Filet de boeuf Aberdeen Angus, cresson, champignons sauvages, essence au vin rouge’ (Roasted fillet of Aberdeen Angus beef, braised Jacob’s ladder, watercress, wild mushrooms, red wine essence’. Wow, this was melt in the mouth tasty, perfectly cooked beef (not that I expected anything less, especiallly from a good Aberdeen Angus), a delicate red wine sauce, wonderfully orange wild mushrooms and then, I tried the braised ‘Jacob’s ladder’. I must admit to being unfamiliar with a ‘Jacob’s ladder’. It’s a rather traditional cut of beef also known as ‘short ribs’ and benefits from slow cooking. It was one of the best pieces of beef I have ever tried, totally dissolved in to your mouth with a wonderfully rich flavour. I think I might just have to investigate cooking with a Jacob’s ladder in the future! And so our thoughts were turning to all things sweet, and our pre-desert of ‘Raviole de Peches et D’abricots, verveine citronne’ appeared (Peach and apricot ravioli, lemon verbena). 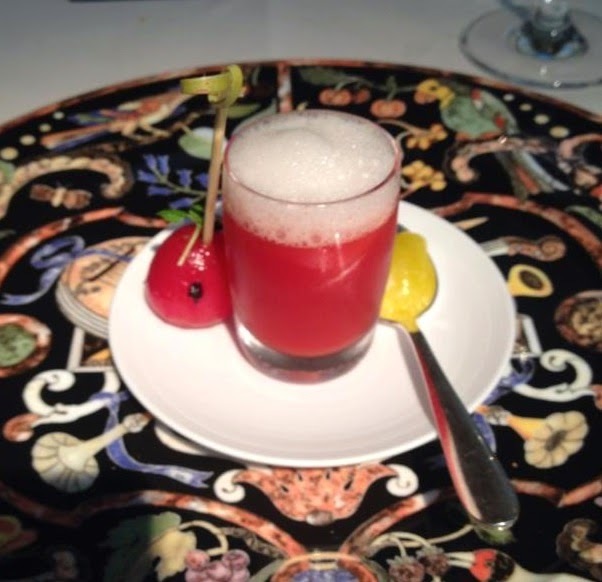 Oooh I love all things fruity and this was a total delight! Not too sweet, an amazing tangy abricot and peach sorbet served on top of a whole apricot which was stuffed with a beautifully light filling, served with a hint of pistachios. Definitely my kind of desert! It was then that our menus began to diverge a little, two of us had opted to ‘upgrade’ our desert, whilst one stuck to the coconut and chocolate option. I must admit to not having considered that my pre-desert was going to be apricot-y prior to ordering my ‘Cassoulet d’abricots’, I probably wouldn’t win any awards in menu planning with this but I was totally delighted when it arrived! This was most definitely the best desert I have ever had in any restaurant, totally delicious! 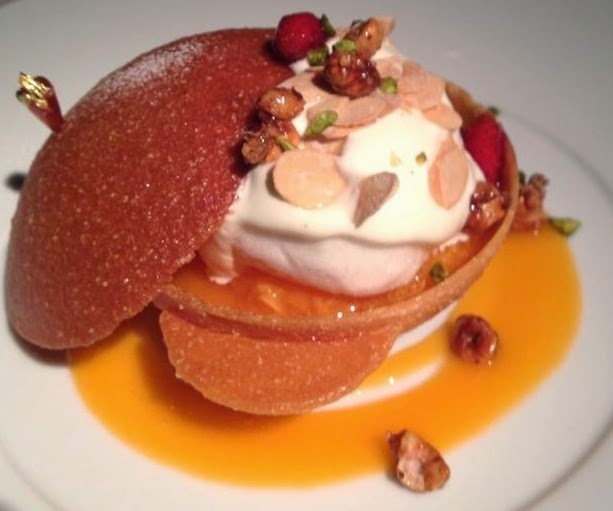 A beautifully delicate tuile bowl (with lid and gold leaf handle), crammed with fresh apricots, abricot puree, a floating light as a feather meringue, topped with some flavoured icecream/cream with praline nuts and super tasty wild strawberries. It was just perfect for me! 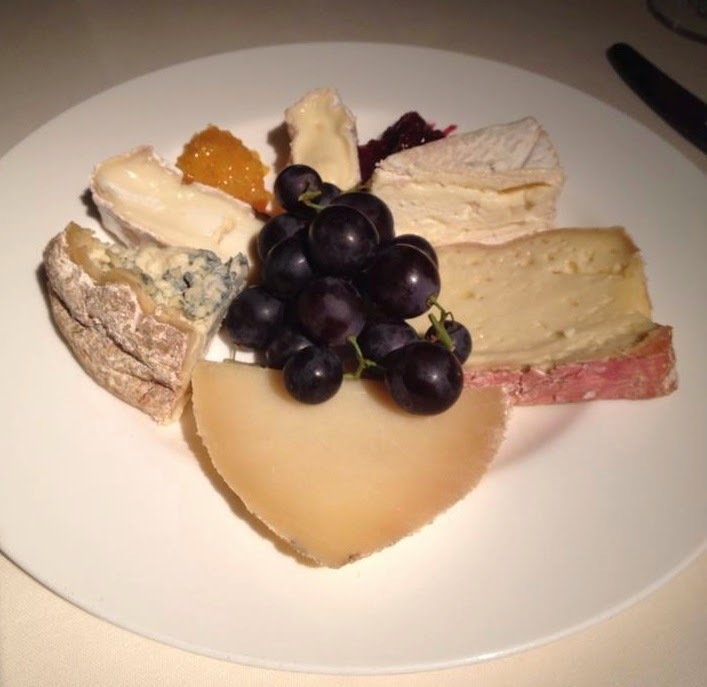 And so we eyed up the cheese trolley, YUM, a wonderful selection of cheeses, all perfectly ripe and ready to devour. We were sensible and opted to share one cheese board portion between us which was perfectly enough for us all. Served expertly with some grapes, and sweet chutneys and an assortment of crackers. With our night drawing to a close, we adjourned back to the lounge for teas, coffees and petit fours. A HUGE menu of teas and infusions were offered and it was hard to chose between them. 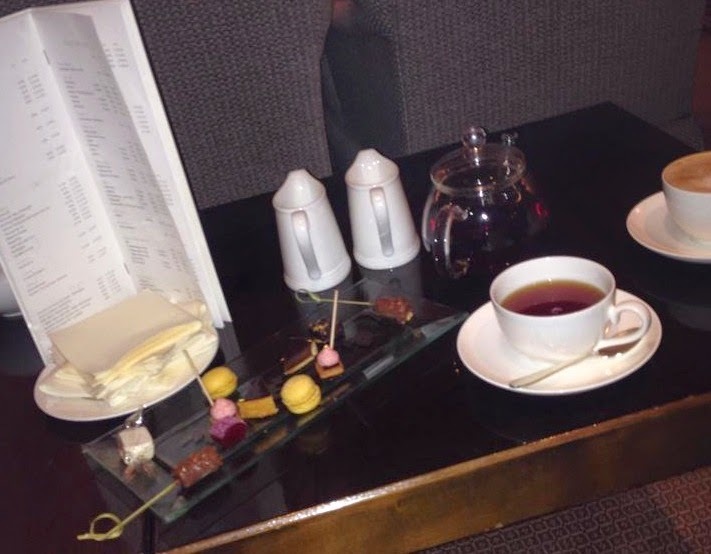 I eventually opted for a spiced tea, which was served in a glass teapot with lots of little morsels of sweet delights, lemon macarons, nougat, Turkish delight, and fruity mousse. A perfect ending to a delectable evening. Petit fours, teas and coffee from a huge tea menu! Overall we all had a wonderful evening, amazing food in a wonderful setting. 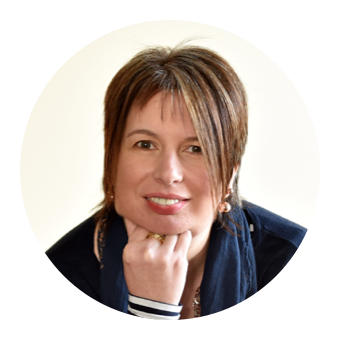 We also inevitably had a much lighter wallet than when we started however, the attention to detail and the quality of the food and service was second to none. If you were ever feeling the need to splash out on the Dining Experience at Le Manoir, I’d heartily recommend it. I think their Michelin stars have nothing to fear.